The process of reconstruction of the whole cathedral was to start only after some years upon the arrival of Miguel de Poblete in 1653. On July 24, 1653, the new archbishop Miguel de Poblete entered the city of Manila after arriving in the port of Cavite from Acapulco and sadly viewed the ruins of the old cathedral and the temporary camarin which served as the cathedral in the middle of the plaza. He had the ugly camarin removed and cathedral services temporarily installed in the Church of the Confraternity of La Santa Mesa de Misericordia. For the next six years, the Misericordia Church would function as the interim cathedral. Immediately, the new archbishop planned to reconstruct the stone cathedral. On April 20, 1654, the cornerstone of the new cathedral was laid by Archbishop Poblete with the governor general, the Royal Audencia, the Cabildos, and the religious communities inattendance. Archbishop Poblete personally went on foot around Manila, soliciting donations for the cathedral project. In spite of the relative poverty of the city denizens at that time, the good archbishop was able to collect 3,000 pesos in contributions. To this initial fund, he added whatever little money he had. He even made a wooden scale model of the proposed edifice which would have three naves and would be of the Roman Doric order. From 1658 to 1659, work on the cathedral was hastened. At this stage, contributions began pouring in. The Spanish monarch donated 22,000 pesos from the Royal Treasury of Mexico. Supporting the completion of the project were the products of the vacancies of the archbishopric. When all the donations were spent, the Archbishop sold his silverware, his pectoral cross and ring just to keep the construction going. By 1659, the cathedral’s naves were already enclosed and the Sagrario de los Curas, the choir and the Chapter hall were finished. At this time, Archbishop Poblete decided to hold Holy Mass in it. The Church of Misericordia, which had served as interim cathedral, was asked to transfer all the cathedral ornaments to the new structure’s sacristy for this event. On December 5, 1659, the archbishop consecrated the big bell and blessed the belfry of the new Manila Cathedral. On December 7, 1659, eve of the feast of Our Lady of the Immaculate Conception, the Archbishop celebrated low Mass in the Sanctuary of the new cathedral. The following day, the feast itself, a Pontifical Sung Mass was celebrated in the cathedral with the governor general, the Royal Audencia, the religious, and other dignitaries in attendance. From then on, the divine functions were performed by the archbishop in the cathedral. More support came for the cathedral, so that by 1662, religious services were held there more conveniently. That year, the main altar of the cathedral was built out of molave, a native hardwood, whereas an artist painted and decorated the silken cover of this altar. Contributing greatly to this cathedral building were Governor Sabiniano Manrique de Lara and the residents of Manila . ” The Cathedral was beautifully built of quarried stone, lime, and gravel. It was 40 brazas long, 15 brazas wide, and 9 branzas high. It had three naves, one at the center and one each on both sides. Each side had seven beautiful columns. The main portal or entrance was adorned with three doors. Each door corresponded to the naves opening out to the plaza. At approximately the middle of the edifice were side doors each leading to the city streets. It had two Sanctuaries – one for Spaniards and another, for natives. There were 8 windows, 4 on each side. Chapels lined the sides with a one-braza elevation from the side streets. The woodwork was all of molave. It had a splendid presbytery, the table of which was 5 steps elevated. The Choir was 3 steps higher than the floor with 52 carved wooden chairs. There were two Pontifical thrones – one on each side of the choir." Archbishop Poblete died on December 7, 1667, bequeathing his wealth for the maintenance and upkeep of the cathedral. In his lifetime, he spent 25,000 pesos for the construction of his beloved cathedral. He also donated ornaments, vestments, and vessels for decoration and use during divine services. 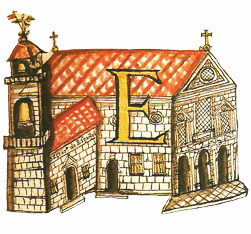 He was also able to obtain sacred relics which he donated to the cathedral church: an arm of San Marcial, an arm of San Jocundo, an arm of one of the 1,000 virgins, and a piece of the Holy Cross of Christ. The relics were encased in special silver and golden reliquaries. He entrusted the completion of the cathedral project to his nephew and executor, Don Jose Millan de Poblete, dean of the Cathedral Cahpter of Manila. The project continued with funds generated by the income of vacant encomiendas and from the residents of Manila. In less than two years, the arches, entrances, and collateral naves were finished. On August 31, 1671, the principal chapel or capilla mayor was completed and dedication rites were celebrated on September 8, 1671, although construction was not yet fully completed. Work continued until 1681 when the sacristy and other offices of the cathedral were built. During the term of Archbishop Diego Camacho y Avila, 1697-1706, the cathedral project received so much attention. The archbishop solicited funds to perfect the cathedral and finish the bell tower. He was able to raise 40,000 pesos for the ornamentation of the cathedral. The periods of building and refurbishing were interrupted by natural calamities, like typhoons and earthquakes, and what were completed had to be restored again. Archbishop Camacho is credited to have completed the sacristy, which was painted and covered with a gilded roof, the Chapter hall, offices, and the choir with its tribunas and grilleworks. He was also responsible for fabricating a lovely pulpit made out of ivory, ebony, and tindalo which the Cathedral Chapter reported to the king as the best in the colony. In the center of the pulpit was the image of the Immaculate Conception of the same material. It was also during Camacho’s term that the bell tower was completed in 1706. Hired to build the six-tiered bell tower was the Sangley master mason Dionisio Saplan. The Cabildo Eclesistico wrote praises about the tower which could compete in beauty and structure with those in Mexico and Peru. When the Arcbbishop left for his new assignment in Guadalajara, the cathedral was fully repaired, complete with bell tower and ornamentations. Fray Juan Angel Rodriguez ascended to the archbishopric of Manila in 1736 and initiated repairs and renovations on the cathedral. In 1737, the media naranja of the bell tower was demolished and rebuilt in brick with a cupola much prettier than its antecedent. The cathedral church itself was in a ruinous condition. Its hardwood flooring was deplorable, the wooden arched ceiling so damaged, and the roof, especially the areas over the collateral naves, had fallen down. The retablos, which were poorly treated, suffered from the effects of water the continuously leaked from the ceiling and ran over it. The choir area was intolerably humid and filthy, a condition brought about by bats which inhabited the space. Totally, the cathedral was very unserviceable except for its walls. Such miserable condition of the cathedral spurred Archbishop Rodriguez to improve the edifice. He replaced the deteriorated wooden parts of the structure and was himself able to obtain 13 large bells for the cathedral. For lack of money for the project, he was prompted to solicit from the government unused stones, bricks, and lime originally intended for royal works. In 1740, he reiterated the request but did not live long enough to realize his dream. Prior to the cathedral’s reconstruction by Uguccioni, the structure was a simple and long quadrilateral church annexed with auxiliary services and spaces to complement and support the main congregation or worship area. To its left side, near the main portal, was the Cathedral Chapter hall and an octagonal bell tower. The cathedral was divided into three naves – a principal nave and two collateral ones – separated by colonnades. Seven chapels founded by the generous faithful flanked the side naves. At the back of the main altar were the sacristy, a small parlor and the stairs leading to the private room above. To the left of the nave, and separated by a patio from the Chapter hall, was the Parroquia del Sagrario, which was the chapel serving as a parish church for Spaniards. It had its own sacristy located immediately behind it. In a small patio located outside the Sagrario and the left wall of the cathedral were 12 houses or casitas, where dwelt poor sacristans. A small pozo or well and a camarin for storage were also located in this courtyard. The cathedral had hardwood flooring, a wooden ceiling, and a height not in proportion to its length. This was the cathedral of Archbishop Poblete and his successors who repaired and improved on it. This was also the same cathedral which Archbishop Trinidad, who was Poblete’s successor, deemed wise to be reconstructed in 1751.